Nine years, nine months and five days after he punched David Koschman in the face and ran away, Richard J. 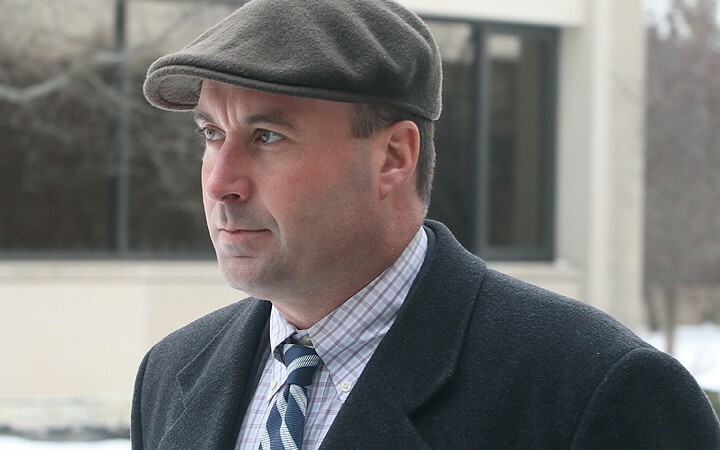 “R.J.” Vanecko — a nephew of former Mayor Richard M. Daley — stood before a judge and admitted he was guilty of causing Koschman’s death. Judge Maureen P. McIntye accepted Vanecko’s guilty plea and ordered him to spend 60 days in jail, followed by 60 days of home confinement with electronic monitoring. The judge also gave Vanecko the maximum 30 months of probation and ordered him to apologize to Koschman’s mother Nanci Koschman and pay her restitution of $20,000. Vanecko has to turn himself in to begin serving his jail time in 14 days. He must serve the full 60 days in jail. He expressed remorse for his actions. “I felt terrible about this since the moment I heard David was injured,” Vanecko said in court. “I cannot imagine the pain and suffering Mrs. Koschman has gone through . . .
After the hearing, he left without further comment, declining to answer questions. Richard Devine, the former Cook County state’s attorney who decided not to charge Richard J. “R.J.” Vanecko in 2004, said of Friday’s guilty plea by Vanecko to a manslaughter charge, “It is what it is. “You have experienced attorneys on both sides who saw this as an acceptable resolution, and the judge approved it,” said Devine, who before being elected state’s attorney was the top deputy to Vanecko’s uncle, Richard M. Daley, hen Daley was state’s attorney. “People can look at situations differently. The responsible attorneys in the state’s attorney’s office reviewed the case and reached a conclusion. The special prosecutors reached a conclusion. That’s part of the legal process. Those things happen. Vanecko’s guilty plea to a charge of involuntary manslaughter — a felony — came nearly 10 years after Koschman’s death following a single punch the Daley nephew threw during a drunken encounter in the Rush Street area. The plea came during a surprise appearance by Vanecko at a pretrial hearing in Rolling Meadows, bringing an abrupt end to the high-profile case. Vanecko had been set to go on trial in less than three weeks. The case had remained in limbo until a series of reports in the Chicago Sun-Times in 2011 prompted the court-ordered appointment of former U.S. Attorney Dan K. Webb as special prosecutor the following year. Webb took the case before a grand jury, which indicted Vanecko in December 2012. It found that Vanecko had used “physical force and, without lawful justification, recklessly performed acts which were likely to cause death or great bodily harm” to Koschman. “This chapter of what happened in the death of David Koschman is over with and resolved,” Webb told reporters after Friday’s hearing. Koschman’s mother didn’t ask for jail time, saying she didn’t want another mother to be without a son, Webb said — but he pushed for it. Nanci Koschman was sitting in court with her sister Sue Pazderski and her lawyers Locke Bowman and G. Flint Taylor when Vanecko walked in with his three lawyers. It was the first time she’d seen Vanecko in person. She turned her back on him. Vanecko, 39, who grew up in Chicago, now works as a millwright and lives in Costa Mesa, Calif., south of Los Angeles. Webb told the judge Vanecko “forcibly struck Mr. Koschman in the face” during a drunken encounter on Division Street near Dearborn Street early on April 25, 2004. Koschman, 21, of Mount Prospect, fell and hit his head on the pavement after being punched. Hospitalized for 11 days, he died without ever regaining consciousness. Vanecko, then 29, “ran from the scene” and got in a cab, Webb said. He was later identified by a friend who had been with him. Police and prosecutors initially decided not to file any charges in Koschman’s death, which remained classified as an unsolved homicide until early 2011. That’s when a Sun-Times investigation prompted a review of the case by the Chicago Police Department. The police again declined to charge anyone, though for the first time they identified Vanecko as having punched Koschman. Bowman and Taylor then successfully sought the appointment of a special prosecutor to reopen the investigation. Webb took the case to a grand jury, which indicted Vanecko, finding that the 6-foot-3, 230-pound former college football player had used “physical force and, without lawful justification, recklessly performed acts which were likely to cause death or great bodily harm” to the 5-foot-5, 125-pound Koschman. Webb also investigated the conduct of the police and the Cook County state’s attorney’s office in the case — a probe that ended last fall with his announcement that he would not be bringing charges against anyone other than Vanecko. Webb filed a report on his investigation at that point, but, at his request, it was ordered sealed until after Vanecko’s trial. Webb said he will now ask that it be made public. After Friday’s hearing, he hugged Nanci Koschman and her sister. Vanecko’s indictment had marked a stunning swing in a case that current and former police officials and prosecutors had insisted didn’t merit criminal prosecution. “There’s no basis for criminal charges,” then-police Supt. Phil Cline, a Daley appointee, said in May 2004. Then-Cook County State’s Attorney Richard Devine, a Daley ally, agreed. The police reinvestigated in early 2011, prompted by a request from Sun-Times reporters to review the case file. Again, they declined to seek charges. They said Vanecko — who never spoke with investigators — acted in self-defense. “Absent evidence that would enable us to prove guilt beyond a reasonable doubt, there is not a good-faith basis to bring charges,” Sally Daly, State’s Attorney Anita Alvarez’s press secretary, said then. But, in April 2012, Cook County Circuit Judge Michael P. Toomin granted Nanci Koschman’s request and took the unusual step of apppointing an outside prosecutor to review the case. “The system has failed” Koschman, Toomin said, ripping “the fiction of self-defense” that he said had been “conjured up by police and prosecutors” and questioning why Vanecko wasn’t charged. Where Vanecko will serve his jail sentence isn’t clear. He asked that he be allowed to serve his time at the McHenry County Jail, rather than the Cook County Jail, citing security concerns. McIntyre said she would see if that’s possible. The case was being heard in Cook County, though by McIntyre, who is a McHenry County judge. Webb had asked that it not be heard by a Cook County judge because of the Daley family’s ties. An Alvarez spokeswoman said she had no comment on Friday’s guilty plea. Daley was out of town and could not be reached. Nor could Cline. In court, Thomas Breen, one of Vanecko’s lawyers, told the judge Vanecko is a “good human being” who regrets what happened during “a brief snapshot of a moment in his life. “Always, he was willing to apologize to Mrs. Koschman,” Breen said.